The kind of person we are can be defined by what we do; the music we listen to, the places we go, the food we eat, the books we read, the interests we have. 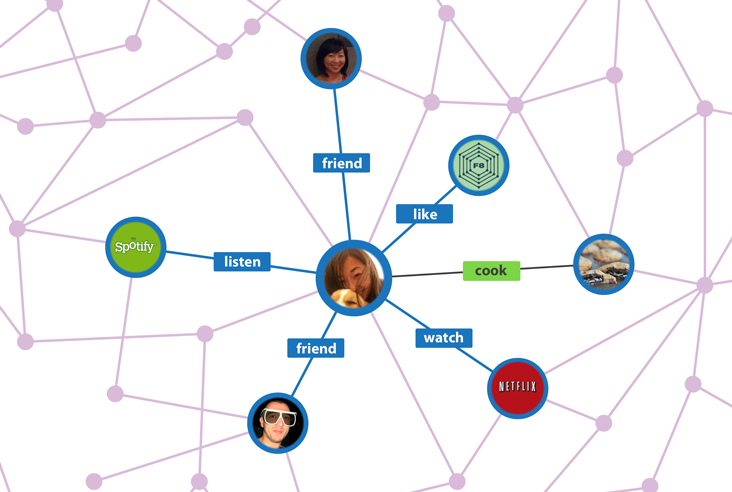 By integrating with the Open Graph, your app can help people express who they are through their Facebook Timeline by publishing the user’s activity in your app to Facebook in the form of Actions (verbs) and Objects (nouns). Apps can define their own custom set of Actions and Objects which let users publish that their listening to songs, reading books, attending events, donating to charities, running a route, visiting a city, that they love an author or have cooked a recipe… These actions appear on a user’s Timeline and, because Actions and Objects are structured data, they can be aggregated in interesting ways – not just the songs I listen to, by my favorite artists. Not just the recipes I cook, but my favourite chefs, restaurants, or cuisines. Actions can be published from any platform: web, mobile web, iOS or Android native – even apps on OS X, Windows or Linux. The Actions your app publishes not only appear on a user’s Timeline, but in Ticker and Newsfeed for their Friends to see which drives traffic to your app on whichever platforms you build for. In 24 hours, build an iOS, Android or Mobile Web/HTML5 app which integrates with the Facebook Open Graph, and publishes Actions that help a user express their online identity through what they do. Extra points will be given to apps which are built for multiple platforms, and make use of advanced features like custom Object and Action references/properties, or iOS and Android native Deep Linking for Open Graph feed stories. The best Open Graph apps come from applying Facebook’s platform to another data set – be it movies, recipes, books, songs, artists, locations, sports. We recommend you find a domain you’re interested in, and which you can get data for. Then model the data in terms of Objects, and link Objects together using References. Then think of the Actions that a user could take in your app, and which you’d like to see from your Friends in your Facebook NewsFeed. ← When was the first computer invented?